If Ancestors Could Talk: Their History Captured in Our Words. This weekend, I’ll venture outside the borders of New England and write some words about, well . . . words. History resides everywhere – in the fieldstone foundations of our cellars, in the names we carry, and in the genes and traits we pass from generation to generation. History also resides in the very words we speak when we talk about history. There’s history in each word of those three sentences that start this post. Take the word ‘weekend’. As a combination of the words ‘week’ and ‘end’, there’s evidence that it has existed since the 1630’s and meant originally the period between Saturday noon and Monday morning. As a two-day period including all of Saturday and Sunday, the word ‘weekend’ didn’t become commonly used until the 1870’s. (Interestingly, the word ‘weekday’, meaning any day other than Sunday, predates the word ‘weekend’ by some 1000 years.) Weekends, as two-day events, have 19th-century labor organizers to thank for their existence. As workers left farms for the cities in search of employment, they adapted to lives set by the rhythms of their employers’ clocks. As workweeks shrunk back to five days, the designation of Sunday as the laborers’ day of rest was an easy choice; Saturdays were chosen to accommodate the Sabbath of the considerable number of Jewish immigrants arriving to the US during the latter half of the 1800’s. Although the word ‘weekend’ didn’t arrive into English until relatively recently, its component words of ‘week’ and ‘end’ date to the Old English period, which spans the years 450 to about 1100. There’s evidence to suggest that the Romans introduced the concept of a week to the English, or – better said – to the people whose descendants would one day speak English. The Romans arrived in Britain as conquerors during the first century, AD, and brought with them their neatly-set out 28-day lunar cycles, which were divided into four seven-day weeks. The word ‘end’ is also quite ancient in the English language, dating back to the Old English period as well, and also arrives to English via earlier ancestor languages. Now, consider the word ‘very’. The word didn’t exist in English before the middle of the 1200’s, when it was adapted from the Anglo-French verrai. It didn’t take on its current meaning of ‘greatly’ until two centuries later. 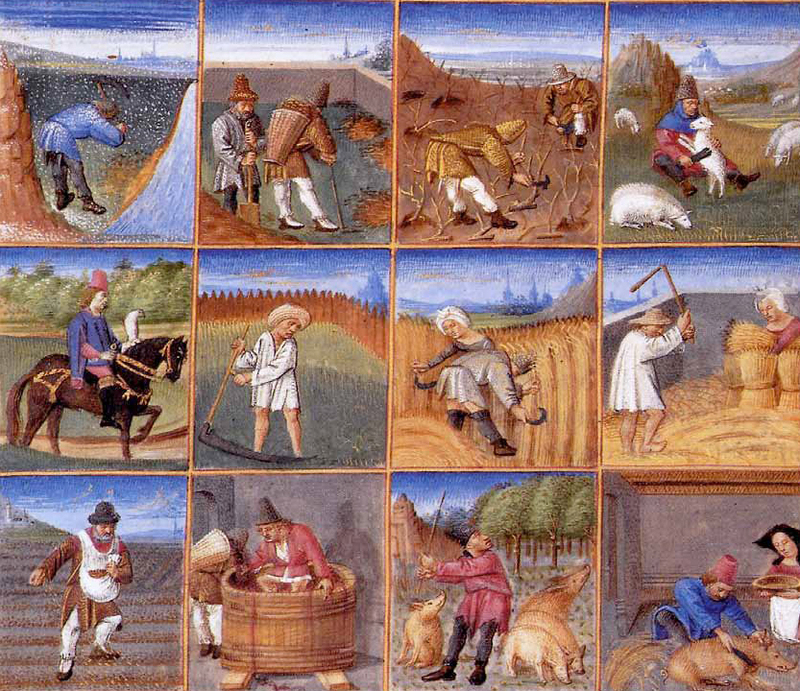 Modern English has many words adopted from medieval French. By some estimates, some 10,000 words entered English during the Middle Ages; most of those words are still in use today. 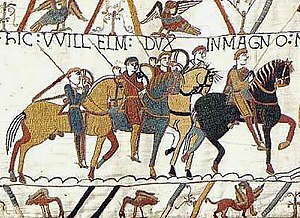 These Anglo-French words owe their existence in English to the outcome of one of history’s most influential battles – the Battle of Hastings, fought on an English battlefield on October 14, 1066. The implications of that battle’s outcome to English, European, and even world history far surpass the scope of this post. However, from a linguistic perspective, imagine English without the italicized words of the first three sentences above. Each of those words descends from French, as it was spoken during the Middle Ages by the Norman conquerors and their Anglo-Norman descendants who followed them. 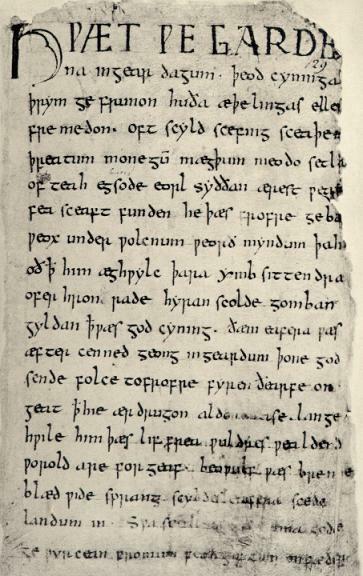 With the Norman Conquest of England in 1066, English passed from its Old English period into the Middle English period. Grammar changed; spelling changed, but so did vocabulary. French words replaced English ones. In some cases, both English and French words co-existed, with the French words becoming the more formal choice among near-synonyms. As the upper classes of society either became Anglo-Norman, or at least increased their interactions with them, French words came to describe culture, aristocratic life, politics, and religion, while English words continued to describe everyday life as it was experienced by the peasantry. In the field of linguistics, the concept known as ‘register’ basically provides an academic term to describe that tendency people have to adjust their word choice and pronunciation, based on their audience. People do this today – and they did it in the Middle Ages, as well. To return to the sentences above, ‘venture’ is a higher-register verb than, say, ‘go’, and ‘resides’ is of a higher register than ‘lives’. Similarly, as you ascend up the linguistic register in Modern English, a ‘chat’ may become a ‘discussion’, which could then evolve into a ‘dialogue’. Some nuances associated with these modern linguistic registers can be traced to the Norman conquest of England. As we’ve said, when the Norman aristocracy replaced its English predecessor in the years following the 1066 Battle of Hastings, the English language experienced a large influx of Norman-French words into its vocabulary. Many of these new words replaced their English counterparts. Some were added to the English language and existed alongside the English words. One example involves food. While animals grown by the Anglo-Saxon peasants kept their names, the food they eventually came to be was described using inherited words derived from the French that the Anglo-Norman nobility found more familiar. These distinctions remain today, almost 1000 years later. While the peasants raised pigs, chickens, and calves, their Anglo-Norman overlords ate pork, poultry, and veal. Similarly, amongst themselves, English-speaking peasants might have spoken about meeting a ‘seller’ in the ‘wood’. If they were talking with the Anglo-Normans, they might have switched to higher register words and begun speaking about meeting ‘vendors’ in the ‘forest’. In my post on February 19, we explored the English of Eastern Massachusetts, i.e., Boston, how it’s spoken today, and how this differs from the spoken English of the early 19th century. This post continues the discussion, but focuses more on how the words we choose each carry their own histories. The words of any language, English included, reflect vast stores of history. In some cases, these words are acquired for concepts or items that are unfamiliar, as was the case with many new world items that English had no name for. In others, change is imposed by the winning side in a war, as was the case with the Norman Conquest of England. At any rate, careful examination of the words we use can reveal a wealth of information about our society’s and language’s history.